Silver Cake. 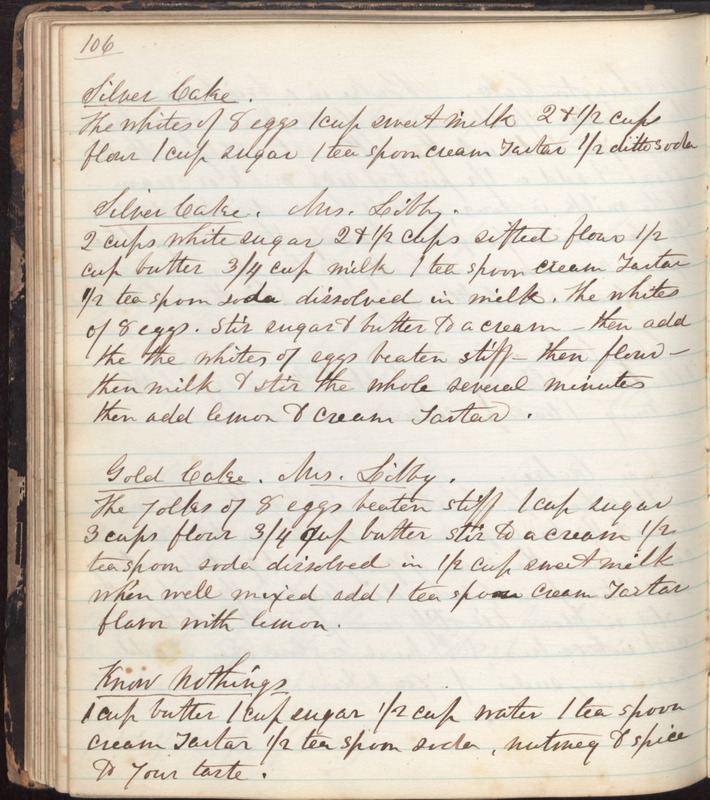 The whites of 8 eggs 1 cup sweet milk 2 & 1/2 cups flour 1 cup sugar 1 teaspoon cream tartar 1/2 ditto soda Silver Cake. Mrs. Libby. 2 cups white sugar 2 & 1/2 cups sifted flour 1/2 cup butter 3/4 cup milk 1 teaspoon cream tartar 1/2 teaspoon soda dissolved in milk. The whites of 8 eggs. Stir sugar & butter to a cream - then add the the whites of eggs beaten stiff - then flour - then milk & stir the whole several minutes then add lemon & cream tartar. Gold Cake. Mrs. Libby. The yolks of 8 eggs beaten stiff 1 cup sugar 3 cups flour 3/4 cup butter stir to a cream 1/2 teaspoon soda dissolved in 1/2 cup sweet milk when well mixed add 1 teaspoon cream tartar flavor with lemon. Know Nothings 1 cup butter 1 cup sugar 1/2 cup water 1 teaspoon cream tartar 1/2 teaspoon soda, nutmeg & spice to your taste.